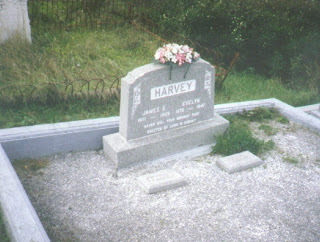 Today I'm writing a "Tombstone Tuesday" blog, in honour of the paternal great-grandparents that I never knew. James Edward HARVEY and Evelyn Julia POTTLE were my father's Newfoundland grandparents. He also never knew them, as his father ran away from Newfoundland at age 15, to join the Royal Navy and sign up for WWI. James was born in Freshwater, near Carbonear, Newfoundland in 1851. He married Evelyn Julia POTTLE in 1895. Evelyn was born in the next door village of Flatrock in 1872. They had 10 children including my grandfather. James was a fisherman who went to sea on extended fishing trips up the coast of Labrador for months at a time. The family were from "planter" stock - that is settlers who were settled near the coast, and had "fishing rooms" and land. From what I have read about early Newfoundland, it seemed like it was an incredibly hard life. The little we knew about my great-grandfather was that he died young, while at sea and had been pickled in rum to preserve him and buried much later. Terrible waste of rum I thought. I found out later, he was actually packed in ice and buried three months later. His youngest child Julia, was born three months after he died. I was relatively new to family history research when I found out about James and Evelyn. I had posted my interests in researching my grandfather Hedley HARVEY from Freshwater, Newfoundland on a Newfoundland genealogy site (Newfoundland Grand Banks), and got a message through from a Fred HARVEY. Fred (now in his 80s) turned out to be a distant relative. His great-grandfather John and mine (James) were brothers. So he sent me the above picture of my great-grandparents tombstone. Up till then, I wasn't even sure of what my grandfather's parents names were. Fred was able to give me all his research, which I have incorporated into mine (correctly cited of course), and he has also been kind enough to send me what photos he had, and also any copies of certificates I might be interested in. Fred had been unaware of my grandfather's children and grandchildren. This was sufficient information to really get me started on researching my father's family tree. Sadly, I don't have any photos of James and Evelyn - apart from this one of their tombstone. And I am still trying to find out about Evelyn's POTTLE family. I have been told that they owned the general store in Flatrock, but have yet to verify it. Anyway, RIP to my great-grandparents James and Evelyn. Wish I could have conducted an oral history with you, I'm sure there are lots of great stories that you could have told.